It was established in 1951 by the Nafplio Progressive Association and is located in the center. It is housed in the neoclassical building, which was the old girls school. 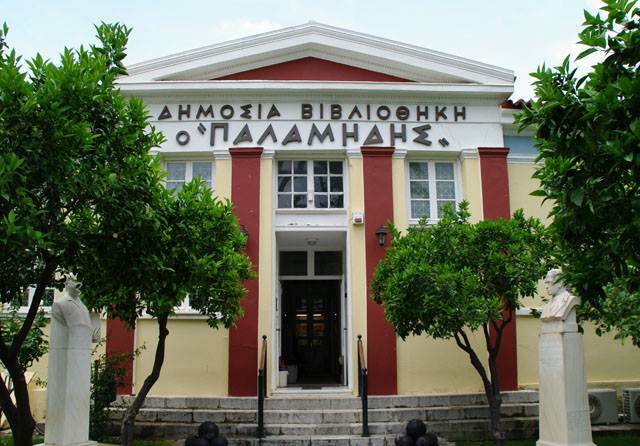 The great works of Greek writers are preserved in the library, as well as an archive of new and some old local newspaper. Library readers can find current newspaper issues and magazines, reference books for school, and over seven hundred books that relate to local topics and general knowledge. Its aim is to make the book as much accessible to the general public as possible. It is clear that this will help maintain the rich spiritual heritage and generally contribute to the cultural and spiritual uplift of our country. Lectures, seminars, conventions, conferences, contests as well as painting and sculpture exhibitions are occasionally held in the rooms of the library.